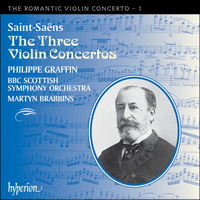 These sparkling performances of Saint-Saëns' violin concertos are a fitting start to Hyperion's new series of Romantic Violin Concertos; a follow on from the highly successful Romantic Piano Concerto series. Saint-Saëns C Major concerto resembles Mendelssohn's great violin concerto. Both are declamatory, extravagant in character, highly lyrical and immediately establish the soloist as a romantic protagonist. Though more conventional, the violin writing for the Concerto in A Major is ever-inventive, especially in the witty second episode where the hen from Le Carnaval des Animaux makes a premature entrance. This was the first of several works he composed for the great Spanish violinist Pablo de Sarasate; in 1859 just fifteen years old but already a famous virtuoso. Saint-Saëns' instantly memorable melodies are a feature of all his best-known works, and there are tunes in abundance in the well-known B Minor Concerto. The intense B minor mood probably offered inspiration for the violin concertos of Elgar and Bartók. Berlioz’s well-known witticism concerning the young Saint-Saëns—‘Il sait tout, mais il manque d’inexpérience’ (‘He knows everything, but lacks inexperience’)—conveys genuine admiration whilst suggesting a want of the sort of youthful extravagance that can lead to great achievement. Saint-Saëns himself described a similar aspect of his musical character, in contrast with his friend Bizet: ‘He sought passion and life above all things, whereas I ran after the chimera of purity, of style and perfection of form’. This goes some way towards explaining how such an inventive and productive composer, friend of Liszt and one of the earliest to understand the import of Wagner, could remain so traditional in many aspects of his music. In his concertos, however, the clarity and balance he sought for is allied to a sensitive and often innovatory approach to the concerto form, and to a strong feeling for idiomatic solo writing—just as accomplished when writing for violin or cello as for his own instrument, the piano. And, even if form were a primary considera­tion, he did not neglect passion and life. The earliest of the three violin concertos is the C major which, though composed in 1858, was only published as No 2 in 1879. Marsick gave its successful first performance the following year at the Pasdeloup concerts in Paris. It’s not known for what occasion it was originally composed; Saint-Saëns already knew several notable violinists, among them the Belgian François Seghers, founder of the Société Sainte-Cécile, who had introduced him to Liszt, and George Bridgetower, the Afro-English violinist for whom Beethoven had written his ‘Kreutzer’ Sonata. By 1858 Saint-Saëns had already become a highly accomplished composer, with three symphonies, a mass, numerous songs, cantatas and instrumental works to his credit. As with all his subsequent concertos, there is no traditional extended orchestral introduction; instead, he follows the example of Mendelssohn’s Violin Concerto in setting up an accompanimental figure over which the soloist enters with the main theme. In the classical manner, this is based around the notes of the C major chord but with a declamatory, extravagant character that immediately establishes the soloist as a romantic protagonist. The theme has a contrasting, more lyrical continuation, after which, again following Mendelssohn’s model, the orchestra takes up the opening melody in an extended tutti passage that also introduces two important subsidiary ideas. When the violin re-enters, the music moves to E major for the second subject. This turns out to be based on the lyrical continuation to the first theme. In a typically subtle piece of thematic organisation, Saint-Saëns refers, during the continuation of this melody, back to the concerto’s opening bars. Throughout the movement, indeed, he develops his ideas with remarkable resourcefulness, rarely repeating anything exactly. The cadenza arrives in the expected, conventional way, towards the end of the movement. Following Mendelssohn again, Saint-Saëns writes out his own cadenza and, in a most original touch, gradually re-introduces the full orchestra, beginning with the timpani, during its concluding passage, based on a long, sustained G.
For the A minor Andante, Saint-Saëns adds a harp and three trombones to the orchestra, the harp providing a bardic accompaniment to the violin’s melancholy melodies, the trombones together with bassoons adding a sombre, antique-sounding counterpoint to the opening motif. There’s a dramatic middle section in the major, culminating in a grandiose fanfare. During the latter part of the movement the woodwind voices emerge increasingly as alternatives to the violin. In the course of an extended coda, the music builds to a climax over a pedal bass, just as in the first movement’s cadenza, after which there’s an unexpected turn to a luminous A major before a return to the sombre mood and sound of the opening. Then the oboe, quite suddenly, takes us without a break into the lively rondo finale. Though this is more conventional music, the ever-inventive violin writing gives a sparkling impression, especially in the witty second episode where the hen from Le Carnaval des Animaux makes a premature entrance. If the C major Concerto shows Saint-Saëns handling resourcefully a traditional form, in the A major work of the following year his inventiveness extends to the actual formal outlines—a single Allegro movement enclosing an Andante middle section. It was the first of several works he composed for the great Spanish violinist Pablo de Sarasate, in 1859 just fifteen years old but already a famous virtuoso. It’s tempting to see the Concerto as a portrait of the young maestro—impulsive and mercurial at the start and then, at the next solo entry, graceful and elegant. (We can hear these qualities in the recordings Sarasate made in 1904.) The soloist’s opening gesture, with its chordal motif followed by a rhythmic figure, is rarely absent for long, and gives rise to a large variety of different continuations. The Andante interlude has the simplest design—an extended violin melody framed by an introduction and postlude incorporating a tentative woodwind figure accompanied by violin trills. The organization of the Allegro is much more complex and dynamic, especially the way the material is re-ordered and re-composed after the Andante. Sarasate was also the dedicatee of Saint-Saëns’ next and final violin concerto, written in 1880. In the twenty years that had elapsed since the A major Concerto he had produced four further concertos (Nos 2, 3 and 4 for piano, No 1 for cello). He had discovered, too, the ability to write instantly memorable melodies that is a feature of all his best-known music, and developed a colourful, romantic harmonic style, with modal inflections that cloud the tonality, and often substitutes more remote chords and keys for the ones we expect. When, in the first movement, he brings in the sensuously lyrical second subject, not in the key of G major which he has seemed to prepare, but in the more remote E major, we feel transported to a magical world far removed from the passionate directness of the concerto’s opening pages. This intense B minor mood, which surely offered inspiration for the violin concertos of Elgar and Bartók (No 2), is put into even sharper relief by the gentle barcarolle that forms the second movement, set in the extremely remote key of B flat major, with no attempt to effect a tonal transition. As in the C major Concerto’s Andante, Saint-Saëns delights in relating the solo violin to the contrasting individual voices of the woodwind, establishing an intimate chamber-musical atmosphere. The arpeggio passage near the close where the violin, playing harmonics (Sarasate was particularly fond of them), is joined by the clarinet, creates a strikingly original effect. Le célèbre mot de Berlioz à propos du jeune Saint-Saëns «Il sait tout, mais il manque d’inexpérience»—véhicule une authentique admiration, tout en suggérant l’absence de cette sorte d’extravagance juvénile qui peut mener à de grandes réalisations. Saint-Saëns décrivit lui-même un trait similaire de son caractère musical, par contraste avec son ami Bizet: «Il rechercha la passion et la vie par-dessus toute chose, tandis que je courus après la chimère de la pureté, du style et de la perfection de la forme». Ce qui concourt un peu à expliquer comment un compositeur aussi inventif et productif—ami de Liszt, il fut l’un des premiers à comprendre l’importance de Wagner put demeurer si traditionnel dans maints aspects de sa musique. Dans ses concertos, cependant, la clarté et l’équilibre auxquels il aspirait sont alliés et à une approche délicate, souvent novatrice, de la forme concerto, et à une forte sensibilité envers l’écriture soliste idiomatique—qu’il composât pour violon ou pour violoncelle comme pour son propre instrument, le piano. Et, même si la forme fut une considération essentielle, il ne négligea ni la passion, ni la vie. Le plus ancien des trois concertos pour violon est celui en ut majeur qui, quoique composé en 1858, ne fut publié qu’en 1879, sous le numéro 2. Marsick le créa, avec succès, l’année suivante, aux concerts Pasdeloup (Paris). Nous ignorons pour quelle occasion il fut originellement composé; Saint-Saëns connaissait déjà plusieurs violonistes remarquables, dont le Belge François Seghers—fondateur de la Société Sainte-Cécile, qui l’avait présenté à Liszt—et George Bridgetower, violoniste afro-anglais pour qui Beethoven avait écrit la Sonate à «Kreutzer». En 1858, Saint-Saëns était déjà devenu un compositeur fort accompli avec, à son crédit, trois symphonies, une messe, de nombreuses mélodies, des cantates et des œuvres instrumentales. Comme tous ses concertos, la présente pièce ne comporte pas la traditionnelle grande introduction orchestrale; en lieu et place, Saint-Saëns suit l’exemple du Concerto pour violon de Mendelssohn et instaure une figure d’accompagnement, par-dessus laquelle le soliste entre avec le thème principal. Conformément à la manière classique, ce dernier se fonde autour des notes de l’accord d’ut majeur, mais avec un caractère déclamatoire, extravagant, qui pose d’emblée le soliste en protagoniste romantique. Le thème se poursuit, plus lyrique et en contraste, puis, de nouveau—et à l’exemple du modèle mendelssohnien—, l’orchestre reprend la mélodie d’ouverture dans un passage de tutti prolongé, également introductif de deux importantes idées subsidiaires. À la ré-entrée du violon, la musique se meut jusqu’à mi majeur, pour le second sujet—lequel s’avère fondé sur la poursuite lyrique du premier thème. Dans une organisation thématique typiquement subtile, Saint-Saëns fait référence, pendant la continuation de cette mélodie, aux mesures d’ouverture du concerto. Tout au long du mouvement, il développe ses idées avec une remarquable ingéniosité, répétant rarement deux fois exactement la même chose. La cadence arrive, de la manière attendue, conventionnelle, vers la fin du mouvement. Toujours sur les traces de Mendelssohn, Saint-Saëns écrit en toutes notes sa cadence et, dans une touche fort originale, réintroduit peu à peu l’orchestre complet (en commençant par les timbales), durant le passage conclusif, fondé sur un long sol tenu. Pour l’Andante en la mineur, Saint-Saëns ajoute à l’orchestre une harpe et trois trombones: la harpe offre un accompagnement «bardique» aux mélodies mélancoliques du violon; quant aux trombones, associés aux bassons, ils apportent au motif d’ouverture un contrepoint sombre, de sonorité antique. Survient alors une dramatique section médiane, en majeur, qui culmine en une grandiose fanfare. Durant la seconde partie du mouvement, les voix des bois apparaissent de plus en plus comme des alternatives au violon. Au cours d’une coda prolongée, la musique atteint à un apogée sur une pédale de basse, juste comme dans la cadence du premier mouvement; après quoi un inattendu virage mène à un lumineux la majeur, suivi d’un retour à l’atmosphère sombre et à la sonorité de l’ouverture. Puis, le hautbois nous entraîne immédiatement, et ex abrupto, clans le gai finale rondo. Bien que cette musique soit plus conventionnelle, l’écriture violonistique, toujours inventive, confère une impression étincelante, surtout dans le spirituel second épisode, où la poule du Carnaval des Animaux fait une entrée prématurée. Si le Concerto en ut majeur montre un Saint-Saëns traitant avec ingéniosité une forme traditionnelle, le Concerto en la majeur (composé l’année suivante) montre l’inventivité du compositeur étendue aux véritables contours formels—un seul mouvement Allegro flanquant une section centrale Andante. Cette pièce fut la première d’une série d’œuvres composées pour le grand violoniste espagnol Pablo de Sarasate, déjà virtuose célèbre, nonobstant ses quinze ans (en 1859). Il est tentant de voir le Concerto comme un portrait du jeune maestro impulsif et versatile, au début, puis gracieux et élégant (qualités que nous pouvons entendre dans les enregistrements réalisés par Sarasate en 1904), à l’entrée solo suivante. Le geste d’ouverture du soliste, avec son motif en accords suivi d’une figure rythmique, est rarement absent longtemps et donne naissance à une grande diversité de continuations. L’interlude Andante est conçu le plus simplement possible: une mélodie violonistique prolongée, encadrée d’une introduction et d’un postlude incorporant une figure préliminaire, aux bois, accom­pagnée de trilles au violon. L’organisation de l’Allegro est beaucoup plus complexe et dynamique, surtout dans la manière dont le matériau est réordonné et recomposé après l’Andante. Sarasate fut également le dédicataire du dernier concerto pour violon de Saint-Saëns, écrit en 1880. Au cours des vingt années écoulées depuis le Concerto en la majeur, le compositeur produisit quatre autres concertos (nos2, 3 et 4 pour piano; no1 pour violoncelle), se découvrit la capacité à écrire instantanément de mémorables mélodies—une caractéristique de l’ensemble de ses plus célèbres pièces—, et développa un style harmonique coloré, romantique, aux inflexions modales embuant la tonalité—nous surprenant par des accords et des tonalités plus reculés que ceux auxquels nous nous attendrions. Quand, dans le premier mouvement, Saint-Saëns amène le second sujet, sensuellement lyrique, dans le mi majeur fort reculé (au lieu du sol majeur qu’il avait semblé préparer), nous nous sentons transportés en un univers magique, bien éloigné de la franchise passionnée des pages d’ouverture. Cette intense atmosphère de si mineur, qui inspira certainement les concertos pour violon d’Elgar et de Bartók (no2), est encore plus âprement soulignée par la douce barcarolle constitutive du deuxième mouvement, sise dans la tonalité extrêmement reculée de si bémol majeur, sans nulle tentative de transition tonale. Comme dans l’Andante du Concerto en ut majeur, Saint-Saëns se plaît à rattacher le violon solo aux voix individuelles, opposées, des bois, instaurant une atmosphère intime de musique de chambre. Le passage en arpèges, près de la fin—où le violon, jouant les harmoniques (dont Sarasate était particulièrement friand), est rejoint par la clarinette—, crée un effet étonnamment original. Berlioz’ bekannte Witzelei über den jungen Saint-Saëns—„Il sais tout, mais il manque d’inexpérience“ („Er weiß alles, doch es fehlt ihm an Unerfahrenheit“)—läßt echte Bewunderung erkennen, auch wenn sie einen Mangel an jener jugendlichen Extravaganz nahelegt, die zu großen Leistungen führen kann. Saint-Saëns selbst hat einen ähnlichen Aspekt seines musikalischen Charakters im Vergleich zu dem seines Freundes Bizet beschrieben: „Er suchte vor allen Dingen Leidenschaft und Leben, während ich dem Hirngespinst der Reinheit, des Stils und der vollkommenen Form hinterhergelaufen bin.“ Diese Aussage trägt wesentlich dazu bei, zu erklären, wie ein so einfallsreicher und produktiver Komponist, der ein Freund von Liszt und einer der ersten war, der die Bedeutung Wagners begriff, in vielen musikalischen Belangen derart traditionell bleiben konnte. Dagegen ist in seinen Konzerten die Klarheit und Ausgeglichenheit, die er anstrebte, mit einem einfühlsamen und oft innovatorischen Herangehen an die Konzertform gepaart, sowie mit einem sicheren Gespür für idiomatische Stimmführung—die gleichermaßen vollendet ausfiel, ob er nun für Violine bzw. Cello schrieb oder für sein eigenes Instrument, das Klavier. Und auch wenn vorrangig formale Belange berücksichtigt wurden, vernachlässigte er doch weder Leidenschaft noch Leben. Das älteste der drei Violinkonzerte ist das in C-Dur, das zwar schon 1858 komponiert, aber erst 1879 als Nr. 2 veröffentlicht wurde. Marsick besorgte im Jahr darauf die erfolgreiche Uraufführung anläßlich der Pasdeloup-Konzerte in Paris. Es ist nicht bekannt, zu welchem Anlaß es ursprünglich komponiert wurde; Saint-Saëns kannte schon damals mehrere renommierte Violinisten, so auch den Belgier François Seghers, den Gründer der Société Sainte-Cécile, der ihn mit Liszt und George Bridgetower bekanntgemacht hatte, einem afroenglischen Geiger, für den Beethoven seine „Kreutzer-Sonate“ geschrieben hatte. Außerdem war Saint-Saëns 1858 längst ein überaus fähiger Komponist, der drei Sinfonien, eine Messe, zahlreiche Lieder, Kantaten und Instrumentalwerke vorzuweisen hatte. Wie alle seine späteren Konzerte hatte auch dieses keine ausführliche Orchestereinleitung im herkömmlichen Sinn; statt dessen hält sich Saint-Saëns insofern an das Vorbild von Mendelssohns Violinkonzert, als er zunächst eine Begleitfigur aufbaut, über der der Solist mit dem Hauptthema einsetzt. Dieses Thema beruht in klassischer Manier auf den Tönen des C-Dur-Akkords, hat jedoch einen deklamatorischen, ausgefallenen Charakter, der den Solisten sogleich als romantischen Protagonisten etabliert. Das Thema erfährt eine kontrastierende, eher lyrische Fortspinnung, woraufhin wiederum nach Mendelssohns Vorbild das Orchester in einer langen Tutti-Passage, die außerdem zwei wichtige Seitenthemen einführt, die einleitende Melodie aufgreift. Wenn die Violine wieder einsetzt, geht die Musik für das zweite Thema nach E-Dur über. Wie es sich herausstellt, beruht dieses Thema auf der lyrischen Fortspinnung des ersten. Mit einer typischen Glanzleistung thematischer Organisation verweist Saint-Saëns, noch während diese Melodie erklingt, zurück auf die Eröffnungstakte des Konzerts. Den ganzen Satz hindurch führt er mit bemerkenswertem Geschick seine Ideen durch und wiederholt dabei kaum einmal etwas genau. Die Kadenz tritt in gewohnter, konventioneller Weise gegen Ende des Satzes auf. Indem er erneut Mendelssohn folgt, schreibt Saint-Saëns seine eigene Kadenz voll aus und führt dann auf höchst originelle Weise während der Schlußpassage auf der Grundlage eines langen, ausgehaltenen G allmählich das gesamte Orchester wieder ein, angefangen mit den Pauken. Für das Andante in a-Moll ergänzt Saint-Saëns das Orchester um eine Harfe und drei Posaunen, und während die Harfe für eine bardische Begleitung der melancholischen Geigenmelodien sorgt, fügen die Posaunen zusammen mit Fagotten dem einleitenden Motiv einen düsteren, altertümlich anmutenden Kontrapunkt hinzu. Ein dramatischer Mittelteil in Dur gipfelt in einer grandiosen Fanfare. In der zweiten Hälfte des Satzes treten die Stimmen der Holzbläser zunehmend als Alternative zur Violine in Erscheinung. Im Lauf einer umfangreichen Coda kulminiert die Musik über einem Orgelpunkt, wie sie es schon in der Kadenz zum ersten Satz getan hat; anschließend erfolgt eine unerwartete Wendung hin zu strahlendem A-Dur, ehe die düstere Stimmung und der Klangcharakter der Eröffnung zurückkehren. Dann reißt uns die Oboe ganz plötzlich und ohne Unterbrechung mit in ein lebhaftes Rondo­finale. Obwohl es sich auch hierbei um konventionelle Musik handelt, vermittelt der durchgehend einfallsreiche Violinsatz einen glanzvollen Gesamteindruck, insbesondere in der witzigen zweiten Episode, in der die Henne aus Le Carnaval des Animaux einen verfrühten Auftritt hat. Während Saint-Saëns beim C-Dur-Konzert bewiesen hat, daß er den geschickten Umgang mit einer traditionellen Form beherrschte, erstreckt sich seine Erfindungsgabe bei dem im Jahr darauf entstandenen Werk in A-Dur auch auf die formalen Konturen—einen einzelnen Satz, Allegro, der ein Andante einschließt. Dieses Konzert war das erste von mehreren Werken für den großen spanischen Violinisten Pablo de Sarasate, der 1859 erst fünfzehn Jahre alt, aber schon ein berühmter Virtuose war. Es ist verlockend, es als Porträt des jungen Meisters zu interpretieren—impulsiv und quecksilbrig zu Beginn und dann, beim nächsten Soloeinsatz, anmutig und elegant. (Wir können diese Charakteristika in den Aufnahmen hören, die Sarasate 1904 eingespielt hat.) Die einleitende Geste des Solisten, an deren akkordisches Motiv eine rhythmische Figur anschließt, ist selten lange abwesend und gibt Anlaß zu einer großen Zahl unterschiedlicher Fortspinnungen. Das Zwischenspiel mit der Bezeichnung Andante ist überaus schlicht angelegt—als lange Violinmelodie, eingerahmt von einer Introduktion und einem Nachspiel unter Einbeziehung einer zaghaften, von Violintrillern begleiteten Holzbläserfigur. Die Gestaltung des Allegros ist wesentlich komplizierter und dynamischer, vor allem in Bezug darauf, wie das Material im Anschluß an das Andante neu geordnet und umkomponiert wird. Sarasate war auch Adressat der Widmung des nächsten und letzten Violinkonzerts von Saint-Saëns, das 1880 entstand. In den zwanzig Jahren, die seit dem A-Dur-Konzert vergangen waren, hatte er vier weitere Konzerte geschaffen (Nr. 2, 3 und 4 für Klavier, Nr. 1 für Cello). Er hatte an sich die Fähigkeit entdeckt, unmittelbar einprägsame Melodien zu schreiben, die seine bekanntesten Stücke auszeichnet; außerdem hatte er eine farbenfrohe, romantische Harmonik entwickelt (mit modalem, die Tonalität verschleierndem Tonfall), die anstelle der erwarteten Töne oft entferntere Akkorde und Tonarten einsetzt. Wenn er im ersten Satz das sinnlich lyrische zweite Thema einführt, nicht in der Tonart G-Dur, die er bis dahin vorzubereiten schien, sondern in weniger naheliegendem E-Dur, fühlen wir uns in eine magische Welt weitab von der leidenschaftlichen Direktheit der ersten Partiturseiten des Konzerts versetzt. Die eindringliche h-Moll-Stimmung, die die Violinkonzerte von Elgar und Bartók (Nr. 2) inspiriert haben muß, wird noch deutlicher herausgearbeitet von der sanften Barcarolle, die als zweiter Satz dient und in der extrem entlegenen Tonart B-Dur steht, ohne daß ein tonaler Übergang versucht worden wäre. Wie im Andante des Konzerts in C-Dur gefällt sich Saint-Saëns darin, die Solovioline zu den kontrastierenden Einzelstimmen der Holzbläser in Beziehung zu setzen und eine intime kammermusikalische Atmosphäre zu schaffen. Die Arpeggiopassage gegen Ende, wo sich der Flageolett-Töne spielenden Geige (Sarasate hatte dafür eine besondere Vorliebe) die Klarinette zugesellt, sorgt für einen verblüffend originellen Effekt.